I have observed over the years that most Sherlockians own a deerstalker hat. They don’t often wear them, because perhaps they are afraid of being identified as part of a fringe group of readers who might firmly believe in something their heart believes is true. But I purchased my own Fore-and-Aft Cap from a mailorder firm in Florida many years ago now, and which, undoubtedly, has gone out of business by now. It is well used and is beginning to fray at the edges, but it will do me for my remaining breathing time. But I have also inherited some deerstalkers from other Sherlockians. My friend Bob Gray died some years ago now. He gave me two first editions of the Hound shortly before his death, along with countless other Sherlockian Treasures, including signed material from Richard Lancelyn Green whom he met at the Metro Toronto library in 1980 when Richard was doing research for his ACD Bibliography with John Michael Gibson. When Bob passed away, his family invited me to select some stuff and I ended up with Bob’s deerstalker, his reading lamp and his Betamax tape collection. The hat is a little small for me, but I will always treasure it. When my friend Bill McCoy died last year, I was in the unenviable position of emptying his apartment. Most of the cupboards and drawers went to Good Will or The Salvation Army, but not his WWII Air Force Uniform, and not his Deerstalker. It too is a little small for me, but I will treasure it always. When I travelled to Don Izban’s CCC (Canonical Convocation and Caper — I think) in 2005 Don Izban presented me with a handsome black and white checkered deerstalker which did fit, and I wear it proudly, and each time I wear it I remember the events of that late summer weekend in Door County, Wisconsin very fondly. It is a wonderful place to visit on the south shore of Lalke Superior. We took the ferry across Lake Michigan on the way home. In early 2010, I purchased some of the books from the library of August Derleth from his daughter April Rose Derleth. His deerstalker came as part of that package. 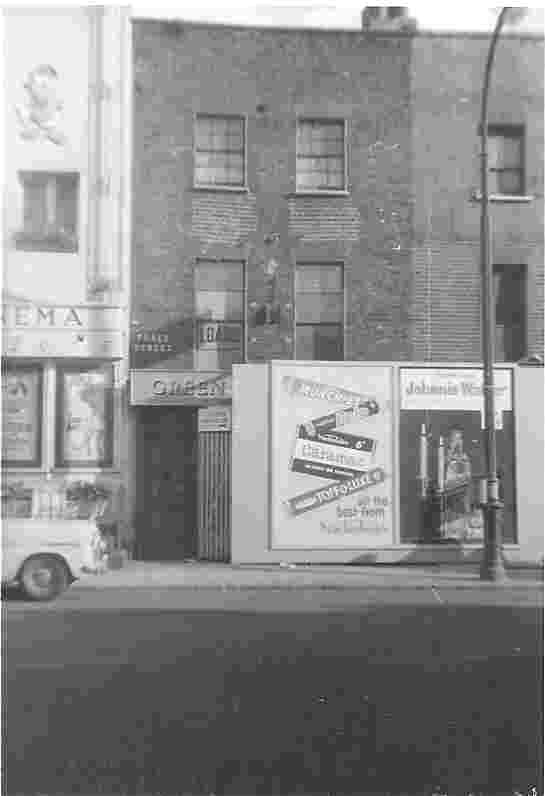 It was still hanging on a coat & hat-rack in his studio library upstairs at The Place of Hawks. I tried it on with trepidation. Alas, it too was small. But it had a label inside which intrigued me “Hawkshaw” this was undoubtedly the manufacturer. BUt it also reminded me of a comic Strip that Derleth collected over many years, and I plan to extract and republish from the State Historial Society in Madison. Hawkshaw the Detective. It had some name changes over the years because of conflict with those two reprobates Denis and Adrian Conan Doyle, but I think a collection of the Hawkshaw strips by whatever name would be a useful adjunct to the Sherlock literature — always remembering, never has so much been published by so many for so few! And finally I contemplated Derleth’s Deerstalker itself. It had a shades of green and dark green checkered design that was familiar to me. 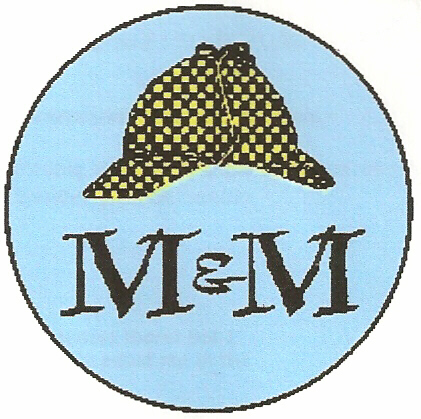 The Mycroft & Moran logo than Coyne (not Utpatel) designed for Derleth in 1945. This hat was the model Derleth used for his logo for his Solar Pons stories! The Muttering Man (7500 words) originally published as 7087 words. The Gresham Marshes (6000 words) originally published as Gresham Old Place 5387 words. two of which to be later versions than the ones that were discovered in the attic of 823 West Johnson and send to the archives of the August Derelth Society. I will include these in “The Dragnet Solar Pons et al.” If you remember I called you about these back in 1993, when I obtained a set from Paul Smedegaard to confirm that he had sent you the same thing. SO, what I thought was final back in 1993, wasn’t final after all. Posted by George A. Vanderburgh on July 16, 2010 in Arkham House, Coming Soon in 2010, Derleth, August W.
No decision has been made on what to do with these manuscripts, and all three of them will be on the agenda, the next time I meet with Bob Weinberg in Chicago, scheduled for the first week in August. Note Bene: Alas, At Pulpfest 2010, Douglas Anderson has informed me that “The Black Solitude” has already been published in Weird Tales March 1951. So now there are only 2, but more news to follow shortly….